E-MUs Xmidi 1×1 Tab is a plug-and-play USB MIDI Interface that adds an ultra-fast MIDI input and output (16 MIDI channels in/out) to your computer. The Xmidi 1×1 Tab is bus-powered for total portability and offers status indicators for input signal output signal and power. 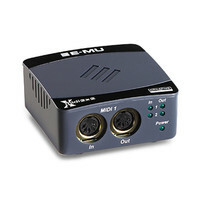 E-MUs Xmidi 2×2 is a compact plug-and-play USB MIDI interface that provides you with two ultra-fast MIDI inputs and outputs (32 MIDI channels in/outs total) allowing you to connect multiple MIDI devices to your computer. The Xmidi 2×2 features bus-powered operation for total portability and provides you with status indicators for each MIDI input and output. E-MUs Xmidi 2×2 is a compact plug-and-play USB MIDI interface that provides you with two ultra-fast MIDI inputs and outputs (32 MIDI channels in/outs total) allowing you to connect multiple MIDI devices to your computer. 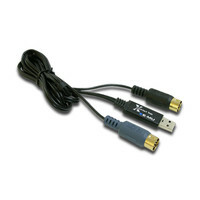 The Xmidi 2×2 features bus-powered operation for total portability and provides you with status indicators for each MIDI input and output.Please note this item was returned unwanted from a customer. The original boxing is scuffed and all the seals are broken.Otherwise the unit itself looks and operates as new and has only been used a couple of times. This is a great opportunity to buy a fully functioning product at a discounted price supplied with a one year warranty.